Unlike spring, when most people are eager to get out in the woods to look for the first wildflowers of the year, summer tends to be a time of vacations, beach trips, family gatherings, and other pleasant diversions. Our many beautiful summer wildflowers are often overlooked, or only perceived as blurs of color as we speed by at 60 mph. Yet both our native summer-blooming wildflowers and the many common introduced plants that line our roadsides in summer have interesting life histories that make them worthy of our appreciation—not only for their beauty but also for their contribution to the overall ecology of our natural world. 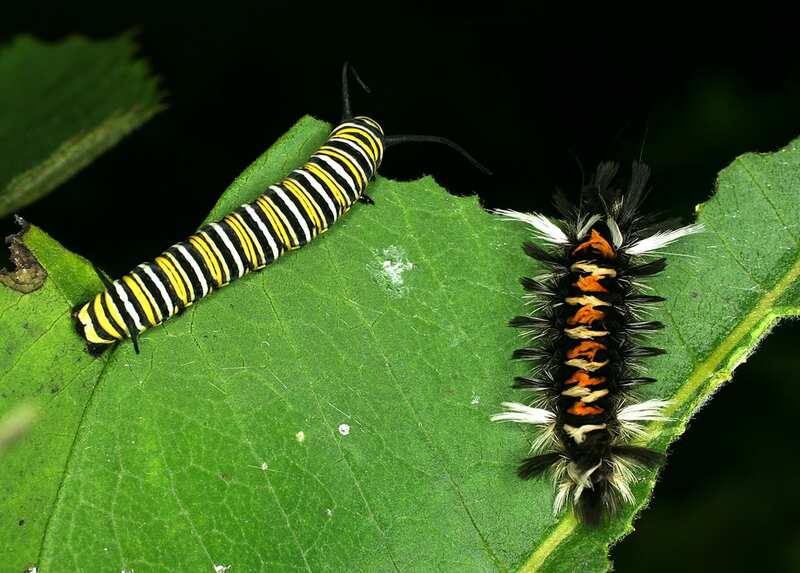 The caterpillars of monarch butterflies and milkweed tussock moths have evolved to be able to eat the leaves of common milkweed without ill effect. The toxic cardenolides in milkweed sap makes the leaves unpalatable to most other herbivores. An individual plant is not an isolated element in the landscape but instead is one component of an integrated landscape. It is affected by soil type, terrain, water availability, and competition with other species for light and space. The plant provides cover for animals, nectar and pollen for pollinators (and other visitors), and fodder for herbivores. To thrive, a plant must continuously evolve to cope with the conditions in its environment, which themselves are often in a state of flux. This is especially true in this time of rapid climate change, with rising temperatures in our part of the world, increased and more severe storm activity in some regions, and severe droughts in others. This is happening at a speed that makes it difficult for plants to adapt rapidly enough to cope with the changing conditions—for the organisms that depend upon plants to stay in synch with the changes. It has been documented in various studies—including one comparing bloom times documented by Henry David Thoreau in the 1800s with those of the same species today—that there has been an overall trend toward earlier bloom times, especially in our spring ephemerals. Time will tell what changes will take place, but a movement of some plant species from south to north and lower elevations to higher is expected, and a decline or loss of other species will most likely occur as well. This is particularly true for those species that now inhabit the zone above tree line in mountainous terrain; once a plant has moved to the mountaintop, there is no longer an “up” to move to. The red color of cardinal flower is particularly attractive to hummingbirds. While imbibing nectar from the deep tubular corolla, the hummingbird’s head comes into contact with the pollen-bearing anthers and is then is carried off to another cardinal flower causing pollination. I enjoy flowers for their beauty, but it’s the adaptations of the plants to their environment that makes them interesting to me—particularly how they attract pollinators (which in some cases accounts for their beauty to the human eye or nose), how they disperse their seeds, and how they defend themselves against herbivores. Herbivore defense may be mechanical—spines or thorns—or chemical—compounds in the plant’s sap that make it unpalatable or even toxic to an animal that attempts to eat the plant. 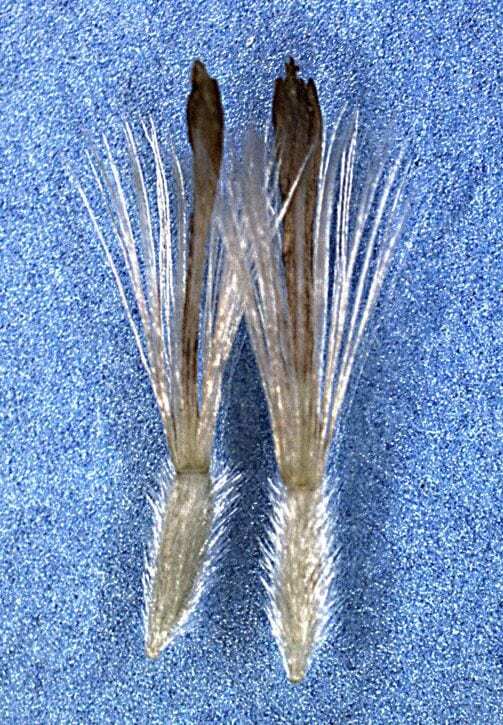 As an example, milkweeds, as a group, are known for their sticky latex, which is full of cardenolides, chemicals that negatively affect the heart. Cardenolides are the toxic chemicals responsible for providing monarch caterpillars and butterflies with protection from predators throughout their lifetimes. No wonder deer avoid eating milkweeds. Yet, lobelias, including cardinal flower, also have a milky sap (though not as sticky as that of milkweed) that contains toxic alkaloids, and deer have not been deterred from eating it in my garden. Thus the toxic principles must be specific in order to deter deer. 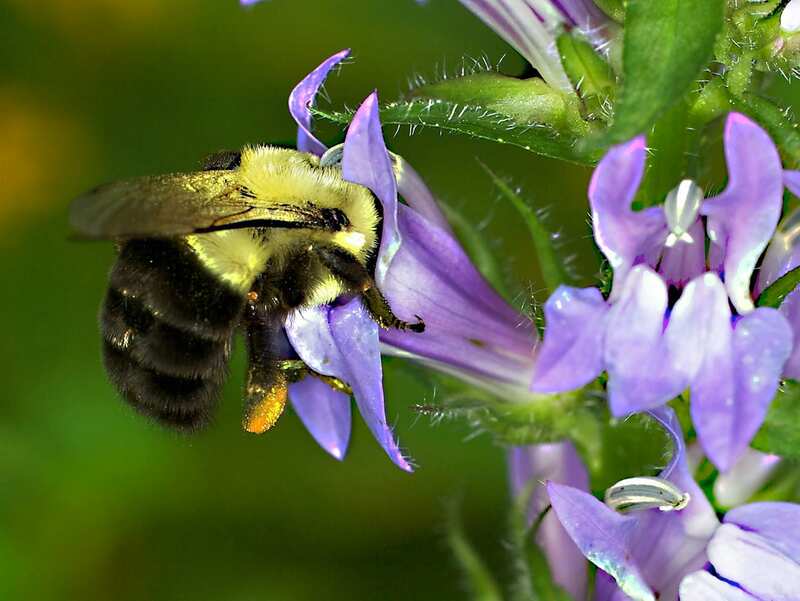 Bumblebees have tongues that are long enough to reach the nectar secreted at the base of the flowers of great blue lobelia, but not those of cardinal flower. Bumblebees are the primary pollinators of this species. I have both cardinal flower and great blue lobelia in my garden. I planted both for their beauty in late summer, and also because I knew that the cardinal flower would attract hummingbirds to the garden. Hummingbirds are known to be especially attracted to red, and the flowers’ long tubular corollas are an ideal fit for the long beak and tongue of a ruby-throated hummingbird seeking nectar. The blue flowers of the great blue lobelia have shorter corolla tubes and are generally pollinated by bumblebees. However, in watching the visitors to my garden, I found that, in addition to the cardinal flower, hummingbirds also visited the flowers of great blue lobelia, and in fact they visited many other flowers, even some with very short corollas. 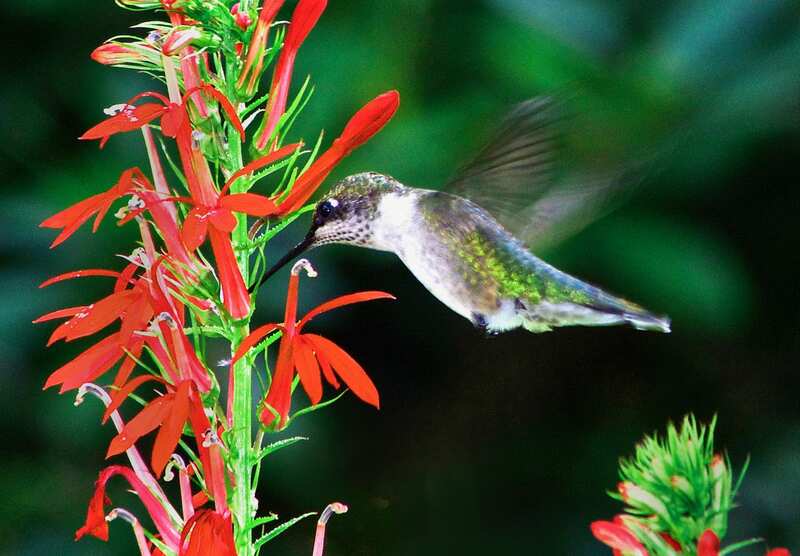 Thus, although cardinal flowers may have evolved an ideal shape and color to attract hummingbirds and are more successful in doing so, the hummingbirds do not ignore other sources of nectar. The fruits of New England aster are the dispersal unit of the plant. Each cypsela (achene-like fruit) is equipped with a plumed parachute that allows it to travel long distances on the wind. Looking at dispersal methods, one can both admire and curse the ability of the propagules of many members of the Asteraceae. The asters and goldenrods in my garden have attempted to dominate the entire garden by sending their achenes airborne on tiny parachutes to land both near and far. True, each flower head must produce many, many fruits, at some cost to the plant, but the result is certainly more than the number of new plants needed to replace the parent plant. Wind dispersal seems to be an ideal way for a plant of open, sunny areas to send its progeny off in search of similar conditions in which to multiply. While I don’t exclusively use native plants in my own perennial garden, they account for the majority of the species that provide bloom from spring to fall. I live in an area that has been ravaged by an exploding deer population, and although some species, like the milkweeds, are generally unmolested, I have found that even some of the “deer-resistant” natives were being browsed. We put up a deer fence! 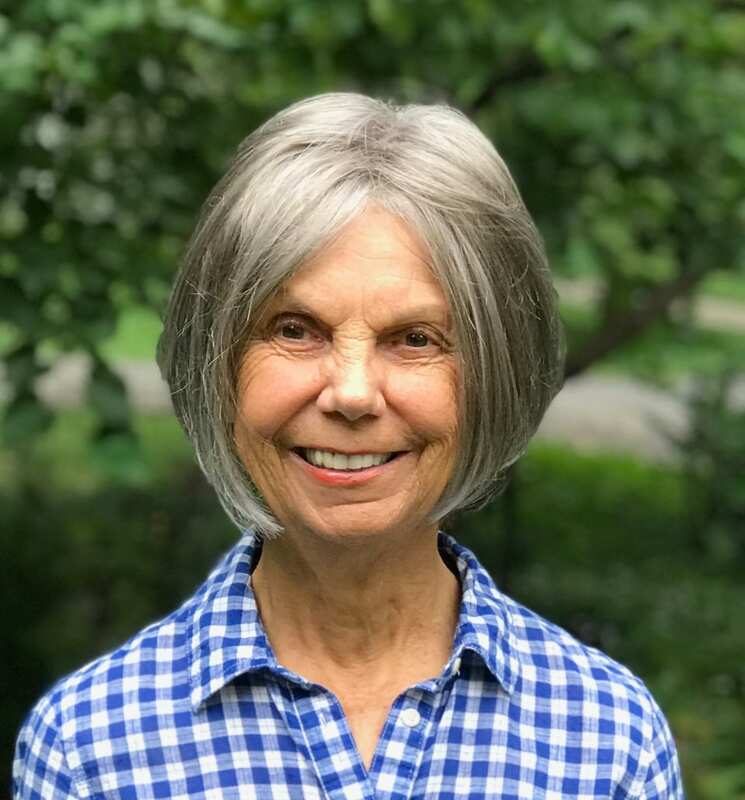 Carol Gracie is retired from The New York Botanical Garden, where she was Director of the Foreign Tour Program and the Children’s Education Department. She later worked in the Science Division, making dozens of trips to South and Central America, both as a tour leader and on botanical collecting expeditions. She is a co-author, with her tropical botanist-husband, Scott Mori, of the two-volume Guide to the Vascular Plants of Central French Guiana. Carol has since returned to her earlier interest in local flora and is the photographer and co-author, with Steve Clemants, of Wildflowers in the Field and Forest: A Field Guide to the Northeastern United States (Oxford University Press, 2006). Her latest book, Spring Wildflowers of the Northeast: A Natural History, was published in 2012 by Princeton University Press. Carol is currently working on a book about the natural history of summer wildflowers.